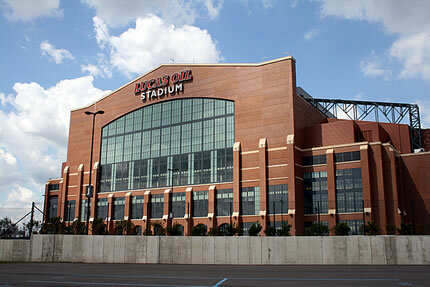 The Big Ten chose Lucas Oil Stadium in Indianapolis as the permanent site of the conference’s new football championship game while deciding to alternate the men’s and women’s basketball tournaments between Indy and Chicago. Even though I believe the United Center would be better served as a permanent host for the basketball tourney (not just every other year), I certainly understand the choice of Indy for the football title game. The SEC provided a template to run a successful conference championship game by finding a permanent location that’s (A) easily accessible to as much as the conference as possible both in terms of where alums live and the schools themselves, (B) consistently dependable as a neutral site and (C) not overly dependent on a “hometown” school for interest. I was encouraged that the Big Ten only considered proposals from Indianapolis and Chicago and didn’t even bother to review bring in places such as Detroit, Cleveland and Green Bay. Nothing against those towns (and there’s a ton of history at Lambeau Field), but the Big Ten was wise to not turn the conference championship game into a political chit to be fought over by its members (which is what happened in the Big 12 and you now see with the Super Bowl). Indy and Chicago were really the only two locations in the conference footprint that could realistically fulfill all 3 requirements above. When a conference deviates from those requirements, you get the 2009 ACC Championship Game in Tampa. Note that when the ACC woke up and moved its conference title game to its true center of Charlotte, it sold out even without any North Carolina-based schools involved. As for the choice to play the Big Ten title game indoors, I’m a born-and-bred Chicagoan and Bears fan that has been to many games in December at Soldier Field, so I’m well-qualified to tell you that brutally cold weather football is f*cking overrated. You’ll get no romanticism from me on missing out on supposed Big Ten football weather. With the wind off of the lake at Soldier Field on December evenings, it generally feels a good 20 or 30 degrees colder than even the coldest November daytime football game in the Midwest. The only other people that could possibly understand how extra cold it is in that atmosphere are those that have been to night games in Green Bay. Since the Big Ten and Fox are always going to want to play the conference championship game in prime time, it pretty much demanded for an indoor venue. Finally, I’ve got to give kudos to Indianapolis for bringing in its big political and business guns, such as Gov. Mitch Daniels, for its presentation to the Big Ten. Whatever one may think of Indiana and Indianapolis, they definitely took the conference seriously, whereas it appeared that Chicago sent Benny the Bull in its uncoordinated effort. Recently retired Mayor Daley used to be able to round up virtually everyone that mattered in town either by mayoral fiat or bulldozing airfields in the middle of the night, so I’m not quite sure what Rahm Emanuel was doing here. Of course, we all know what the best thing will be about the Big Ten Championship Game: Gus Johnson.